A virus similar to the Black Death outbreak has struck England. Mrs. Hawkins soon learns there are things worse than death. The dead have come back to life, and they are hungry. Jim Hawkins is on his way home with treasure in the belly of the Hispaniola. Captain Smollett is back in charge of the ship, and Long John Silver has agreed to stand trial at home, if only for the chance to make it home. 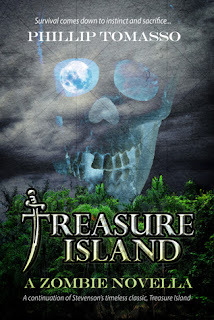 I myself found Treasure Island: A Zombie Novella, to be a great read. Although to me it started off a little slow, it did however pick up real quick about a quarter of the way in to the book. I personally enjoyed reading about Jim Hawkins and how much of a man he has become, along with Long John Silver helping him on this grand adventure. Phillip Tomasso has done a great job of captivating the readers mind by only giving the reader so much at a time and then leaving you wanting more. I personally would recommend this book to anyone who is looking for a classic story with a twist. Phillip Tomasso is the Amazon Best-selling author of The Vaccination Trilogy, and more then eleven other novels. He works full time as a Fire/EMS Dispatcher for 911. He lives with his three kids in Rochester, NY, where he is at work on many novels. This book sounds great. I will definitely check it out. Thank you for the review!